Somewhere in the city of San Juan, in Costa Rica, there is a man. Estamos en los tropicos. Si tu pones unas semillas en la tierra, ellos van a viver. If my memory and my Spanish serve me correctly, it means or should mean that "We are in the tropics. If you put some seeds in the ground, they are going to live.". Bueno. Great way to kill time. Seeds. Ground. Water. Sun. Estamos en los tropicos, indeed. 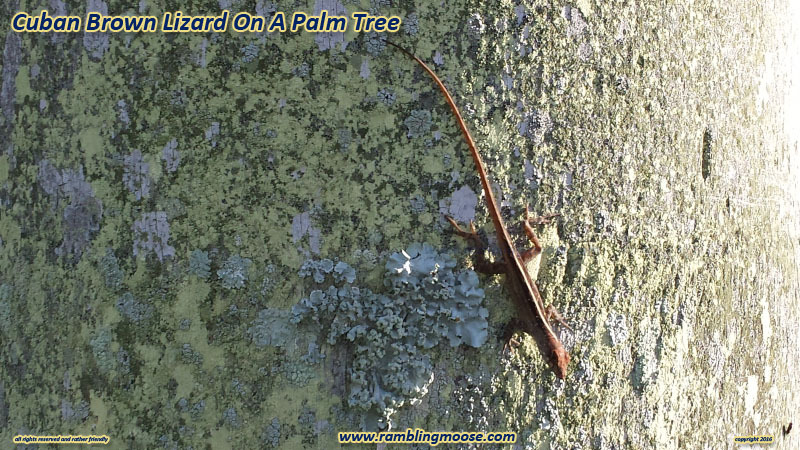 We are in the tropics here in South Florida. As we do our weekend shopping, I see plenty of plants on offer at the big box stores. This happens everywhere, in planting seasons. Not exactly every time seeing that some areas have something called Winter. Ours is blissfully short at two weeks long. We schedule it for the first two weeks of February and are invaded by something called Snowbirds that will clog our skies and our roads and our hotels. They pay our taxes so I can't complain too much, just as long as they stay out of my way. Well never mind that. I did "Go Into Production" here. You see, instead of buying those plants in black plastic pots that are designed to break on the way home, I make my own. I have my own irrigation chain out back that was designed with prominent citizens with parks named after them and people who work in something called Code Enforcement. We designed my one irrigation chain to be a drip feed waterer that could be used any given day to mist the orchids. Now under the orchids that hang on the fence are small muddy patches where the water drips. May as well use that water too. In some spots, I have three pots deep. One pot watering the next and so forth until you eventually hit the deck. All that nonsense gives me the opportunity to plan ahead. I take cuttings from plants that I like, and follow my friend's advice. Stick them in that wet soil and hope they "take". It is possible that I am over-watering things in the yard. My Night Blooming Jasmine is dying off in one spot so I am starting something that is a temporary hedge made of Hibiscus. If the big hotels can do it, so can I. 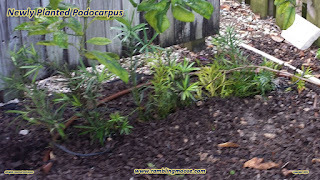 Between the Hibiscus and the Podocarpus cuttings I have in pots and in that bare area in the back of the yard, I have easily 50 plants growing that are destined to be moved. Great. I have made myself work. Every morning between 7AM and 7:30AM, I am inspecting that zone. Making sure that the orchids are getting watered. Making sure the Podocarpus and Hibiscus cuttings are getting dripped on with the excess. Inspecting the Rosemary shrub in the corner. 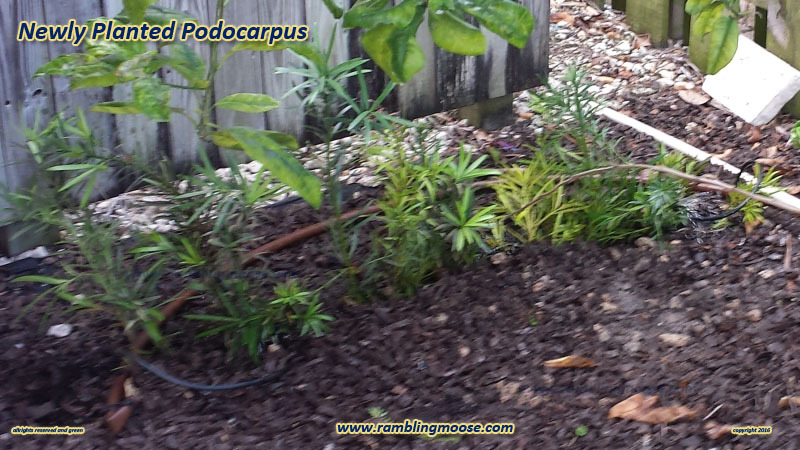 My In Ground area of Podocarpus and Hibiscus way out back. I am also being a bit overly productive. My Condo Mango now has its own cutting to create a tree for a good friend in Key West. That in itself is like taking Coal to Newcastle, but he liked the idea of a 15 foot maximum mango tree. The last four mango pits from Mango Season, it is an event after all, were dropped into a pot and have all sprouted. I will have three trees I have to find homes for since the Mother Plant is currently over 40 feet tall - Think 13 meters for the metrically endowed. Anyone need a Mango Tree Seedling? But it is a nice hobby and it does attract attention. My McNab SuperDog (TM), Rack, will come out with me and water the palm trees writing strings of "M's" on their side. 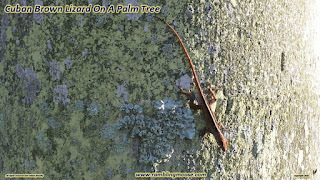 It gives me a chance to be watched by the creatures in the yard, my friends the wee little Lizards. In the case of some of them, they seem to enjoy being watched. I have been followed rather than being avoided more than once. The little "Cuban Browns" are harmless and seem to hang out catching rays and insects while watching me watch them. The worst that a Brown has done to me was to once get surprised and climb up my leg. Luckily I was in the back yard so I dropped Trowel as well as my Shorts and let the little creature have its freedom. Just can't hurt them, they're too comical. So if you are fortunate enough to have the room, and the need, you may as well start some seedlings. After all, they don't all "take" but many do. Why not, you'll have the time!